The Christmas Cactus has as much meaning to me as the Poinsettia. I have never been a winter person in any shape or form. Even as a very young child I felt that it was dismal and gray and of course cold. December in the Midwest was cloudy and devoid of color. Snow blanketed the entire area with a quite solitude and winter was long. My Christmas memories revolve around visits to my grandmothers' and the traditions that both sides made sure to pass onto me. Both of these wonderful women had a green thumb but no one could compare to Grandma Nelson's indoor jungle. One of my fondest memories is that of my grandmother's massive Christmas Cactus. The thing was insanely big and always filled with blossoms in the most brilliant fuchsia pink. My grandmother's flowering Christmas Cactus was the talk of the town. She is the only person I know of that could get their plant to bloom right at the start of the holiday season every year. It was a long dark trek to her house but when we finally arrived at the door we were greeted with warmth, smells of Swedish and Norwegian pastries and a heaven sent display of colors. Brightness and joy filled the air and I would happily shed my layers and settle in. There really isn't a history or story of pagan or Christian origins for this wonderful plant, but it is present in all my holiday memories. 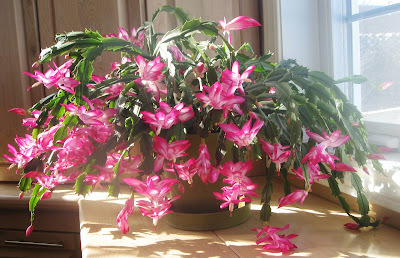 Whenever I think of the Christmas Cactus it is associated with the sweet memories of my grandmother. Christmas traditions don't always have to have roots that go back 100's of years they just need to mean something to you. This adorable "Baby Girl" 3 - 6 mo Beanie (hat) was Crocheted using Caron's Simply Soft Yarn in Autumn Red. The Crocheted Baby Girl Hat was finished off using a Scalloped Edging around the rim. The Hat is accented with a Maroon Satin Bow with a tiny Red Satin Rose attached. The Yarn is 100% Acrylic. 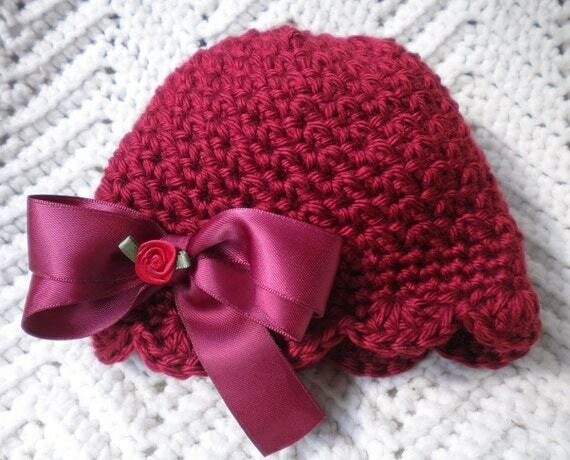 **This hat can also be Custom Ordered in sizes of Newborn, 9 - 12 mo., 18 - 24 mo, or Toddler Sizes. The Hat can also be made in a color of your choice. Fuchsia a pink/purple bright color, Cha-Cha sterling silver beaded ring with a combination of bicone and round faceted Swarovski crystals. Swarovski crystals are the most sparkly and high quality crystals on the market. Each crystal has been wire wrapped with sterling beaded head pins and connected to small loops within the ring. The sterling metal complements and provides a lovely accent for the blue crystals. This ring has a total of approximately 38 to 40 crystals. Place/Subject/Quote: From Front: "Many happy returns of the day"
Pink Breast Cancer Earrings are fun and neon pink so they'll be noticeable on your ears. The pink frames are retro and fun. Fight breast cancer with these pink breast cancer earrings. A portion of proceeds will be donated to the American Cancer Society. I'm a new breast cancer survivor; breast cancer is something we must fight together. This is a giclee print produced on acid free paper using archival inks. Unframed and unmatted. There is a 1 inch white border surrounding the print, allowing for easy framing. 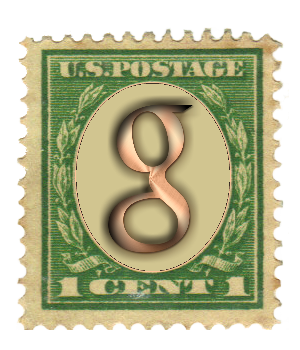 The work can be framed with the deckled edges hidden or in a floater frame emphasizing the deckled edges. These pretty Swarovski crystal earrings have pink Lucite flowers and will be a welcome addition to your jewelry collection. 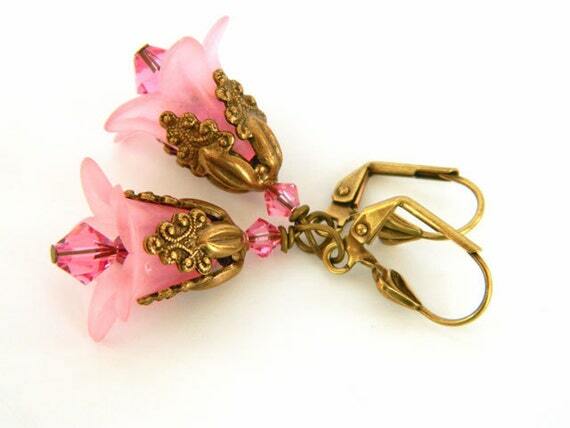 The pink earrings for women have scalloped brass bead caps and brass lever-back ear wires. The flower earrings are approximately 1 inch long. The short earrings would make a great gift for her! This pretty, feminine pink and black beaded bracelet is approx. 7.5 inches long including handmade toggle clasp. I used 11/0 metallic seed beads, 6/0 seed beads and #2 straight bugle beads for this bracelet. Stitched one bead at a time this bracelet is an embellished right angle weave. I used a beaded bead and a circle of beads for the toggle clasp. This handmade pink and black beaded bracelet will dress up a tee shirt or look great with a sweater; give as a gift or keep it for yourself. 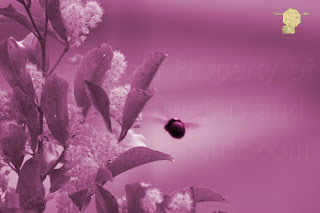 "Flight of Princess Bumble Bee" Having grandchildren helps me see things through a child's eye. I love thinking about how the fun digital enhancements would look in their rooms. This one is dedicated to my little Princess Faith. This necklace is fully beaded with dark pink, known as Indian Pink, Swarovski faceted crystals. Between each of the forty, 8mm faceted crystals are 4mm round sterling silver spacer beads. Necklace is beaded with top rated 49 strands beading wire. Finished with sterling silver findings, including the toggle clasp. Gorgeous keychain featuring miniature art prints created from my original artwork. Perfect to organize your keys and make great gifts for any horse lover. The keyring features the image on both sides encased in clear acrylic. This high quality, acrylic key chain has 2 print inserts (archival quality inks on premium glossy paper). Print is on both sides of keychains. Copyright text is on the print as you can see in the pictures. Outside measurements are approximately 43 mm x 65.5 mm. If you or a friend of yours collect thimbles, these collectible thimbles make the greatest gifts. Lovely little hummingbird flitting about on this handmade thimble. He makes a perfect addition to anyone's thimble collection. This fuchsia pink and black fused dichroic glass jewelry set includes a rectangular pendant and dangle earrings. The brilliant metallic orchid pink dichroic glass is layered on top of a shiny black glass base. The pendant has a dichroic glass rod fused to the top that catches the light and creates a lens effect and sparkle. The pendant is mounted on a silver plated bail. There is a lot of pretty bling in this jewelry set! The rectangular dangle earrings are mounted on sterling silver lever back ear wires that will not slip out of your ears. 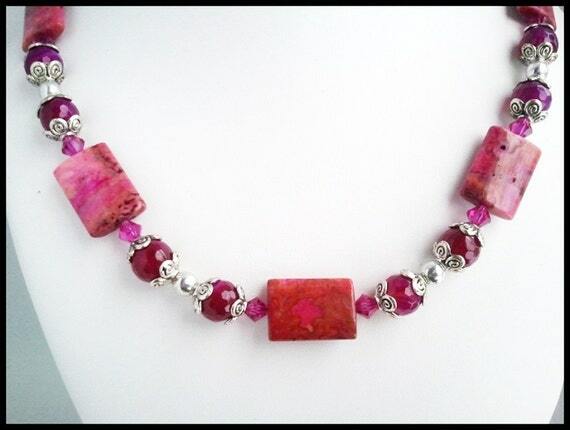 If you are a lover of pink than this necklace is for you. Imagine feeling these luscious agate and Swarovski gemstones against your skin, could it get any better than the feeling of the cool smooth stone you ask; oh yes it most definitely can, not only is the sense of touch delighted by this necklace but the visual appeal of these gorgeous gemstones will appease the utmost of your senses. Nothing will be more magnificent, in a bathroom or kitchen, than the cleaning power of this pink magnolia blossom picture cloth. The cloth is hand knit in an all cotton yarn, measures approximately 10 inches by 11 inches, and is a design by Lisa V. and Allison Barrett (knitwitsheaven). If you pair this cloth with a pretty soap, from one of our Etsy artisans, it would make an awesome gift. Sweet, but not too cute, this pretty pink dog bandana is perfect for Spring, Summer, Valentine's Day or any occasion! Handmade of cotton fabric printed with a geometric flower medallion pattern that resembles chrysanthemums or daisies in white on a pink background. All women love shoes right? You cannot go wrong with this gift for that women that has everything with this high heel shoes Christmas ornament.. I even have several different styles of these for their tree decorations..
Cotton Flower Scarf - Filet Crochet Design - Pink Flowers with Crochet Web - RSS Designs In Fiber Hand-Crocheted this Womens Floral Scarf! 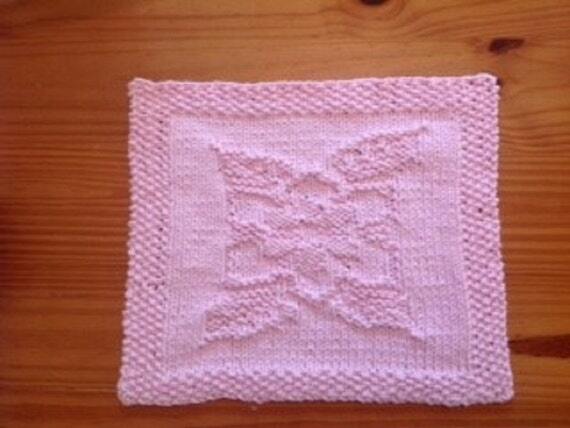 Handmade 100% Cotton Lace is Great for Warmer times - Spring, Summer, Fall! Etched opaque light pastel pink glass handmade lampwork beads with a matte bead finish. Feminine beads hand made using light pastel pink glass. They are delicate looking and would be great for wedding jewelry, bridesmaids, proms, or other fashionable earrings, bracelets and charms. 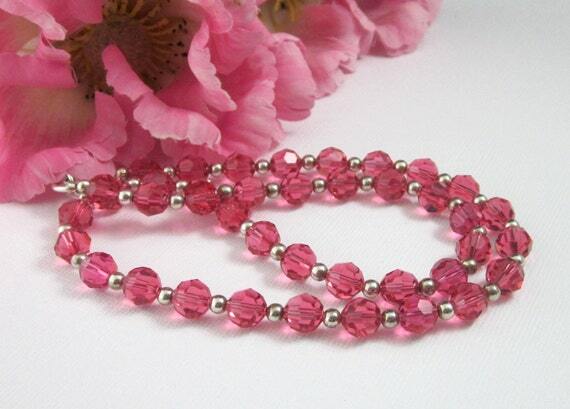 These soft pink beads have a frosted matte glass bead finish. 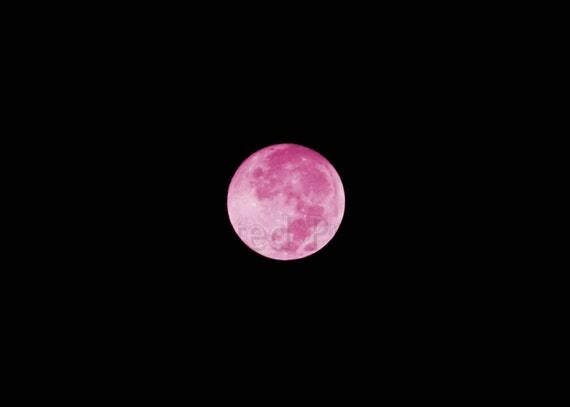 Photograph titled "Bubble Gum Moon". Colorized for a bright bubble gum pink hue. An wonderful piece of wall art for your teen or college student. Would look stunning in their dorm room. Arrange in groups of 4 with my other colors for even bigger statement. Love your memories of Christmas with Grandma Nelson and her Christmas cactus. She certainly had the right touch to get it to bloom perfectly each year. Beautiful choices that match the photo of Christmas cactus! Many thanks for including my earrings. 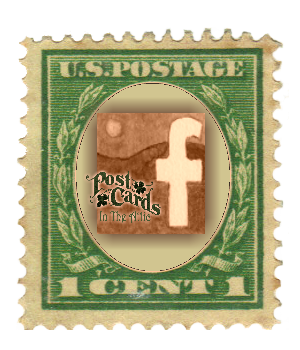 Will share the post and each item. 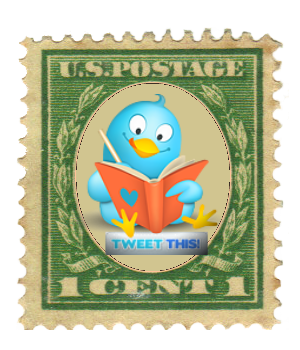 Enjoyed reading about your memory of your grandma's Christmas cactus. I know all about the dark, gray days of winter. I've lived in the Cleveland, OH area all my life. We are having unusual weather now, however, with a high of 70 degrees with tornado warnings. I love that photo of the Christmas cactus. So pretty. Thank you for the post and for including my rose gold Czech earrings. Will be promoting. Thank you for including my Newborn hat among your lovely Christmas items. I always love reading of other's Christmas memories - it brings up so many wonderful memories of growing up with my grandparents (who raised me)! The photo and memory of the Christmas cactus is a treasure. I love all the pink items you choice. As a breast cancer survivor, pink is very important to me. Thank you so much Colleen for sharing this wonderful story with us! I have several of these beautiful cactus that are just now starting to bud. 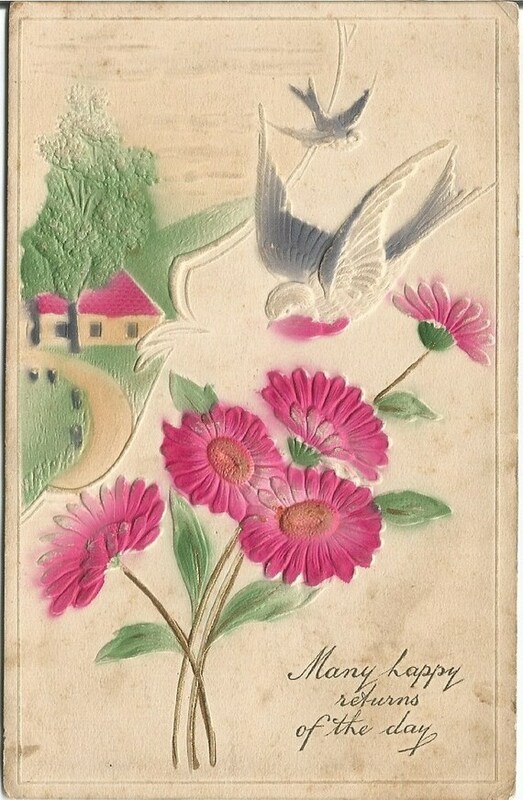 My husband's mother who has passed away had one that came from her grandmother. I was fortunate enough to get one of the one's she propagated from it. I will always treasure it because it reminds me of her. 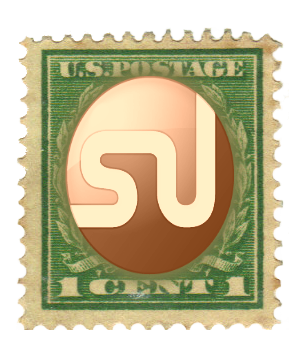 Thanks for helping to promote all of us here! Lovely Family Story - beautiful photo of a Christmas Cactus!! 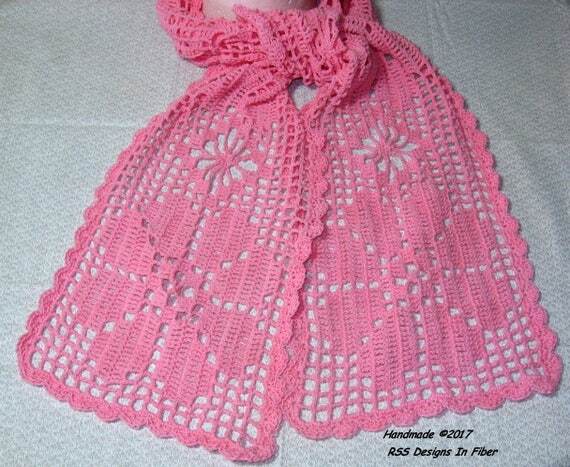 Thank You for including my Pink Flower Filet Crochet Scarf! 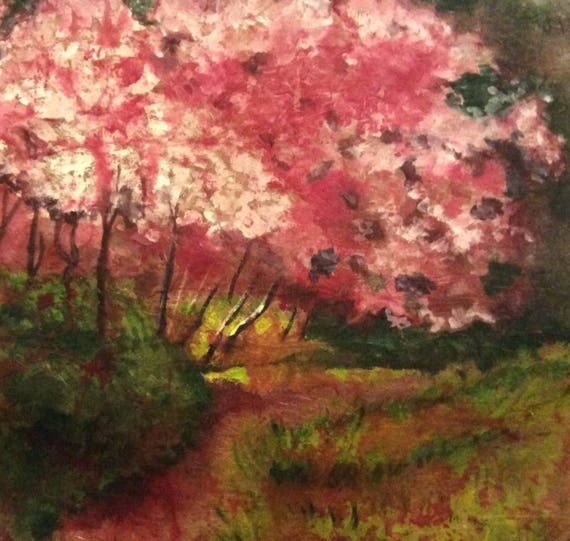 Thank you, Colleen, for including my Cherry Tree painting! What a wonderful story! Promoted the blog and all items. Thank you for including Keli and our pink dog bandana in this week's blog! 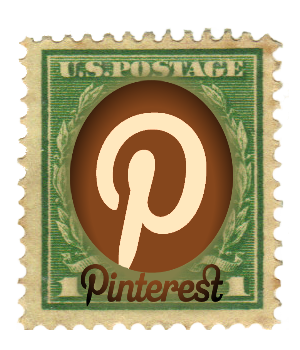 Pinned, tweeted and G+ each item and the post.